Mother’s day is fast approaching and we have everything to help you get ready! With so many choices at your fingertips, it’s easy to create a one-of-a-kind product to make Moms feel special. Choose a fun theme like “Pretty and Pink” or “Spa Day” and let your creativity run wild with our amazing variety of Beauty Bases, Scents and Colors. Moms are strong, Moms are brave, Moms are beautiful! This year add a little sparkle to Mom’s beauty routine. We have loads of different Glitters and Micas that can easily be added to our Suspension Shower Gel, Body Frosting, Foaming Bath Whip, Lotion Bar or SoaP Bases. Take the guesswork out of creating your own ingredient ratios by using our batch calculator, linked here at: https://essentialsbycatalina.com/wp/33/tools-and-calculators/batch-calculator/ . If you don’t have time to whip up a fancy concoction, a quick go-to glam option is our Glamorous Shimmer Mist. The base is extremely easy to use. Simply pour in 3 – 5% fragrance, shake, and you’re good to go. A light misting of this lightweight body spray is all mom will need, then watch as microcrystalline mica shimmers like gold dust in the light. Perfect for all skin tones, our Shimmer Mist creates an incredibly fine sparkle that adds a touch of glitz to Mother’s Day. Lavender E.O.– Always a favorite. We also have a great selection of Lavender Fragrance Oils. Bed of Roses– A beautiful medley of different roses. This fragrance truly smell like you are strolling through a rose garden in bloom. Any Designer Type Fragrance. Which is Mom’s favorite? Dolce and Gabbana? Chanel Chance? JLo Glo? Check out our selection of designer-type fragrances and you are sure to find something mom will love. Coconut: Always a popular fragrance for spring and summer. Who doesn’t love coconut? And we have plenty to choose from. Planning on preparing a special spa day for mom? We carry Natural Sea Salts in various grains that can be customized in so many ways with the addition of fragrance or essential oils, extracts and more. Sea salts function nicely as either as a therapeutic bath treatment or a soothing foot soak. Our Hydra M Face Mask can also be customized to any specific skin type by adding extracts, vitamins and/or fragrance. Botanical extracts are a great choice to add to just about any base for extra beauty benefits. 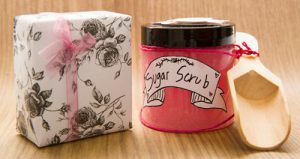 Any one of our sugar, shea or walnut scrubs can be customized to refresh any and all types of skin. Anything Cucumber: We carry many cucumber like fragrances. Essential Oil Blends: we don’t recommend the use of any citrus essential oils in face products because of their photosensitive properties. Fresh Clean Fragrances: anything to leave mom feeling refreshed. Any way you choose to prepare, it is always wise to have gift sets for Mother’s Day. Beautifully packaged sets or baskets make wonderful and easy choices for any customer celebrating that day. Ready to go sets are a favorite for last minute shoppers and are sure to be a hot seller. Consider having presentable and a quick grab items for those panicked customers, desperate to find something nice. This Mother’s Day, save a forgetful spouses skin and make some money all at once.